A Hermit in« Current – A flow of electrical eoergj contiiiuouslj flowing Brst in one direction and then in reverse along a conductor. Usually, the term A.C. refers to a current the values of which when plotted graphically, i.e. amperes against time, result in a graph following a sine curve. It is called a sine wave because it is similar to the curve obtained by plotting the sine of an angle against the angle itself, (see also Phase and Cycle). Alternator – The generator of Alternating Current-usually consisting in its simplest form of a rectangular loop of conductor rotating in a magnetic field and cutting the lines of force alternately at right angles and in the same plane each revolution. If values of current are plotted for one revolution of the conductor, it will be found that the graph is a sine curve. 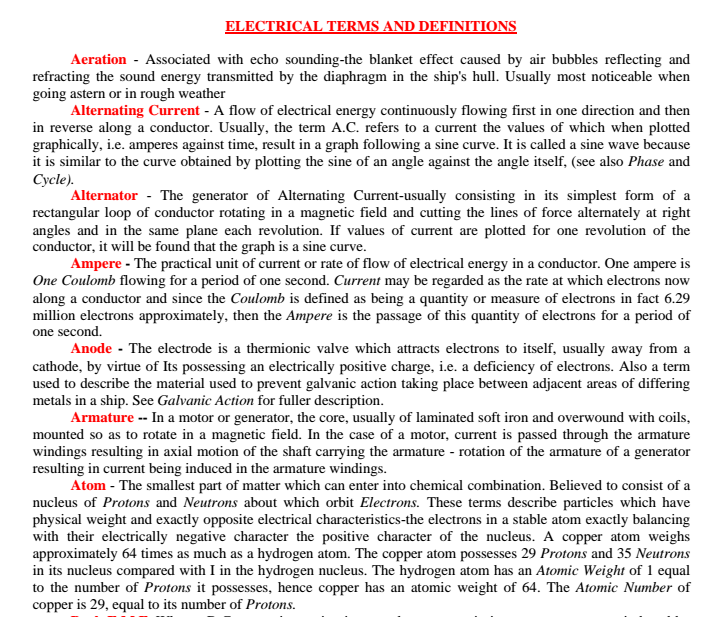 Ampere – The practical unit of current or rate of flow of electrical energy in a conductor. One ampere is One Coulomb flowing for a period of one second. Current may be regarded as the rate at which electrons now along a conductor and since the Coulomb is defined as being a quantity or measure of electrons in fact 6.29 million electrons approximately, then the Ampere is the passage of this quantity of electrons for a period of one second. Anode – The electrode is a thermionic valve which attracts electrons to itself, usually away from a cathode, by virtue of Its possessing an electrically positive charge, i.e. a deficiency of electrons. Also a term used to describe the material used to prevent galvanic action taking place between adjacent areas of differing metals in a ship. See Galvanic Action for fuller description. Armature — In a motor or generator, the core, usually of laminated soft iron and overwound with coils, mounted so as to rotate in a magnetic field. In the case of a motor, current is passed through the armature windings resulting in axial motion of the shaft carrying the armature – rotation of the armature of a generator resulting in current being induced in the armature windings. Atom – The smallest part of matter which can enter into chemical combination. Believed to consist of a nucleus of Protons and Neutrons about which orbit Electrons. 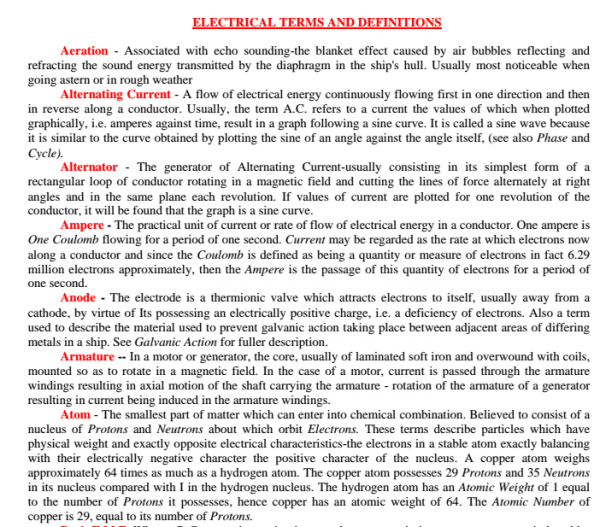 These terms describe particles which have physical weight and exactly opposite electrical characteristics-the electrons in a stable atom exactly balancing with their electrically negative character the positive character of the nucleus. A copper atom weighs approximately 64 times as much as a hydrogen atom. The copper atom possesses 29 Protons and 35 Neutrons in its nucleus compared with I in the hydrogen nucleus. The hydrogen atom has an Atomic Weight of 1 equal to the number of Protons it possesses, hence copper has an atomic weight of 64. The Atomic Number of copper is 29, equal to its number of Protons.